Published on 30 July 2012. This is Bottle of Notes, a 1993 steel and enamel sculpture by Claes Oldenburg and Coosje van Bruggen which forms text from Captain Cook’s journals into a white bottle; a blue note inside is formed of a line of poetry by one of the artists. It’s about 35 feet tall, and leans at a considerable angle. It was forged a little further north in Hebburn. 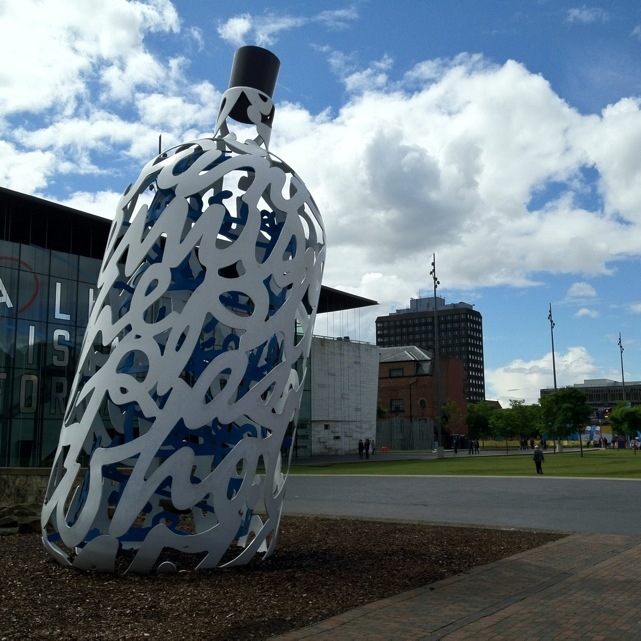 Since the bottle’s 1993 installation, mima – the Middlesbrough Institute of Modern Art – has been built behind it. It opened in 2007, but is (perhaps unfortunately?) best known for hosting Jeremy Clarkson et al’s Top Gear exhibition of automotive art in 2009. This 1,746th post was filed under: Photo-a-day 2012, Art, Middlesbrough.